Thinking of taking the family to Disney? Packed with magic and memories to be made, Walt Disney World in Orlando, Florida is a magical vacation they’ll never forget. 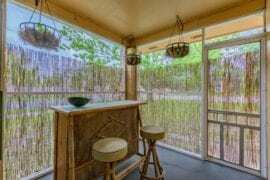 Choosing the best Airbnb homes near Disney World can be tough, but we can help! If you want to be close to Mickey and company, you’ll need to find properties which are within a few miles of Walt Disney World’s iconic parks like Epcot, Magic Kingdom, Disney’s Animal Kingdom, and Hollywood Studios. Orlando is actually a pretty large metropolitan area with multiple suburbs, making it one of the best places to stay near Disney. After a long day experiencing the magic of the world’s most popular theme parks, collapsing into a big fluffy bed is the best feeling. To help you plan ahead, we’ve rounded up 8 Airbnb homes near Disney World that your whole family will love. Make your magical vacation to Orlando even more special. 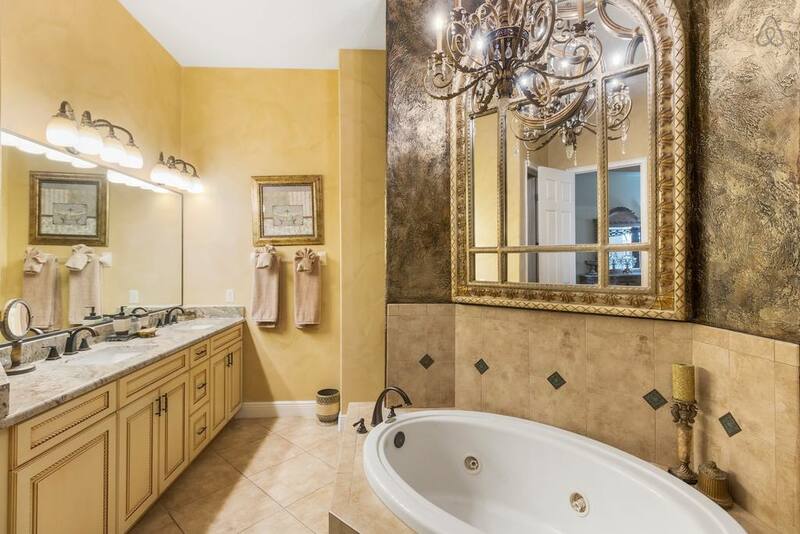 For those who don’t want to stay smack dab in the middle of the chaos, this beautiful and luxurious family townhouse in Orlando is the ideal choice close by! Four bright bedrooms include two king-sized beds and four twin beds, ensuring this property is perfectly set up for a family vacation to Disney. There’s plenty of space for up to 8 guests to relax together at home after a long, theme park-filled day. Guests also have access to a communal clubhouse, which includes a swimming pool, gym, and a hot tub. After a long day chasing the kids and riding rollercoasters, the last thing you’ll want to worry about it cooking — while the townhouse has a huge, modern kitchen with everything you need, the clubhouse has a great restaurant on-site that will surely become your go-to dinner n a pinch. Located literally minutes from the gates of Disney World, and with close access to I-4, this property is a great option for families and large groups alike, from $220 a night. 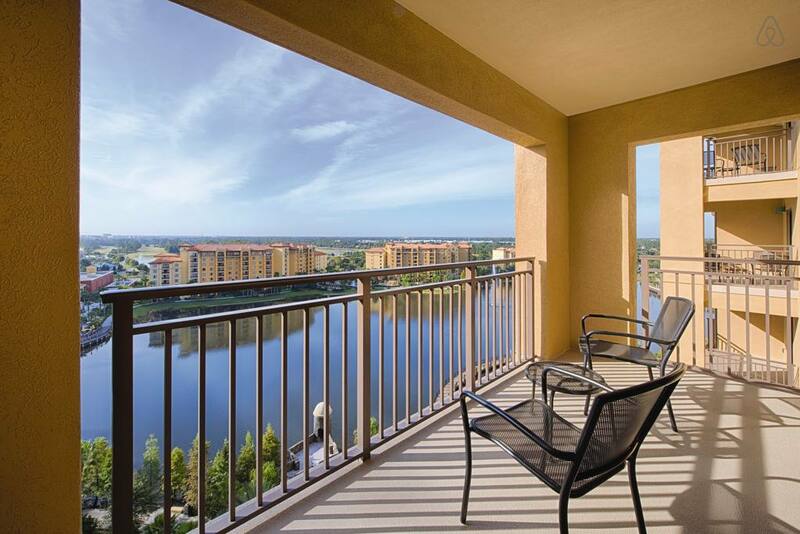 Kissimmee is one of the best places to stay near Disney, especially for a family. 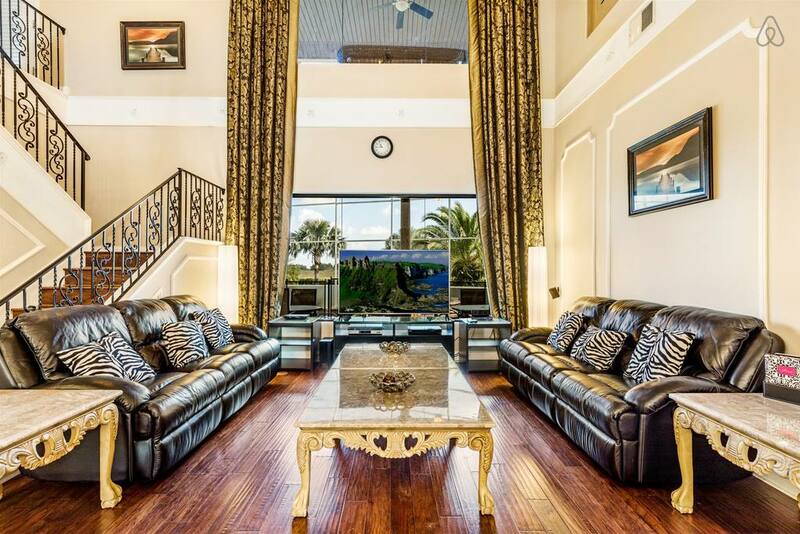 This four-bedroom villa with resort amenities is a luxurious home base for theme park fun. 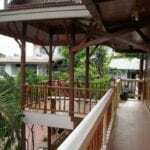 The villa can accommodate up to 8 guests with four big bedrooms (including two with twin beds for the kids), and 4.5 bathrooms. There’s an enormous, resort-style swimming pool on-site and this serviced villa is part of a gated Disney community, for extra security and safety. 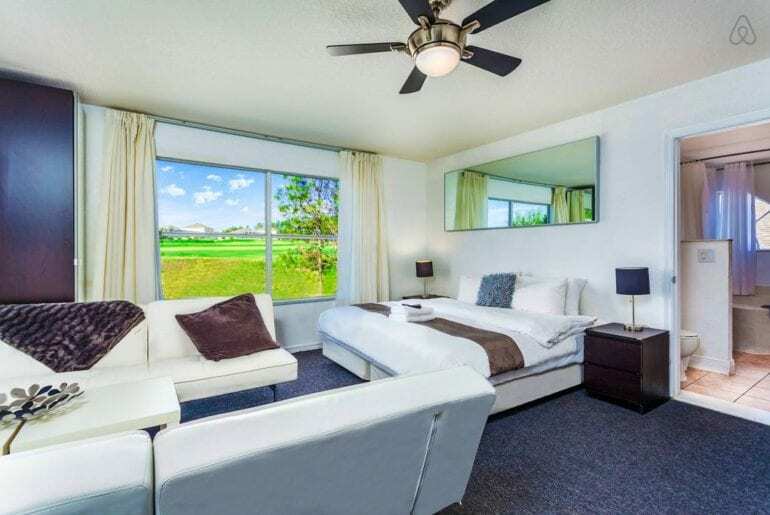 Each room features a large flat screen TV and plenty of space to roam, with air conditioning and all the amenities you will need for a week or two’s vacation in Florida. There is also free transportation to the Disney parks included in the price of the villa, which is a big plus for families looking to make the most of their time in Orlando! One of the most luxurious Airbnbs near Disney World is available from around $330 a night. For around $550 per night, large families can stay in this super-luxurious two bedroomed condo in Bonnet Creek Resort. The gates of Disney World are literally moments away! This award-winning resort boasts plentiful amenities and fun-filled facilities on-site too. There are multiple swimming pools, lazy rivers, gardens, a gym, and parking available. The spacious, two-bedroom suite has space for up to 8 guests, with four beds and two bathrooms. 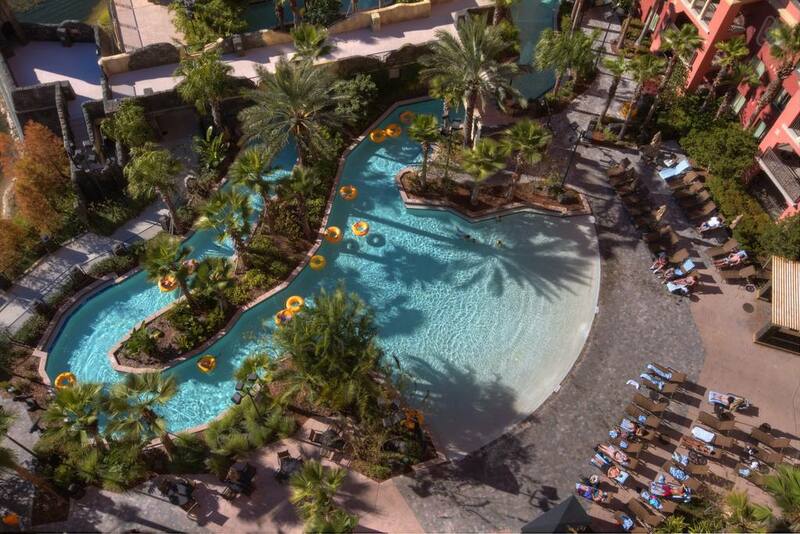 Admire the incredible views of the resort from the large private balcony, the perfect spot to take in colorful sunsets at the end of a long day adventuring around the theme parks. 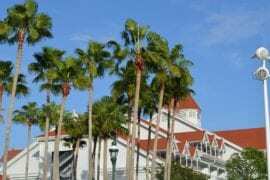 This luxurious condo with excellent resort amenities is a great choice for an easy Florida vacation, making it one of the best Airbnbs near Disney World. With enough space to accommodate 16+ guests easily, this spectacular vacation home just minutes from Disney World is a fabulous find! Spread out in style with your entire extended family, or invite friends along for the fun. This mansion has a whopping 12 bedrooms and five bathrooms, with lots of space to hang out together or retreat for a quiet rest. Overlooking a beautiful golf course, the home has an excellent outdoor patio, screened-in with a private swimming pool, hot tub, BBQ grill, and al fresco dining space. 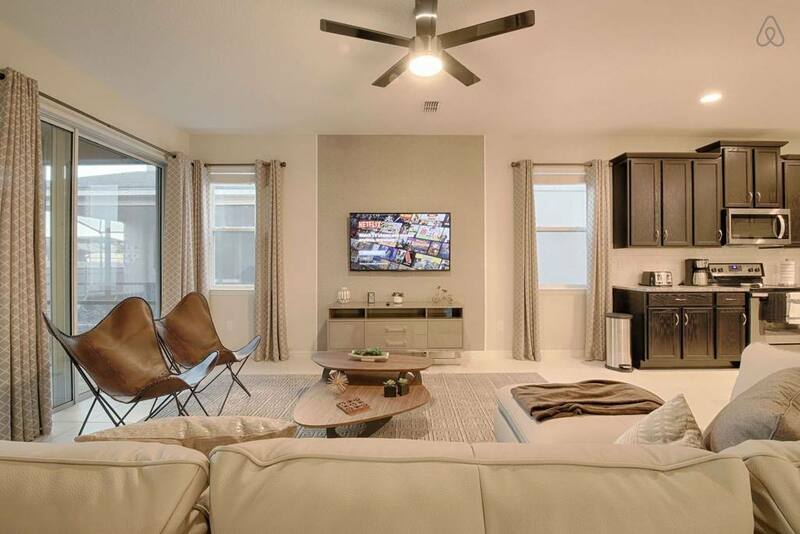 Inside, relax in the comfortable living space, take advantage of a modern, fully-equipped kitchen, or watch a movie in your very own private theater! One of the best Airbnbs near Disney World can be yours from around $550 a night. This sprawling, seven-bedroom mansion with pool is so close to Disney World you can watch the parks’ nightly fireworks display from your private upstairs balcony! Custom-built with lots of luxurious upgrades, the house boasts an incredible floor plan with seven master ensuite-style bedrooms. Some are set up for kids with twin beds and colorful decor, and there are two more shared baths for a total of nine bathrooms. The home is centered around a large, open-concept floor plan with a modern gourmet kitchen, dining space, and a huge living room. There’s even a private movie theater, perfect for catching up on your favorite Disney flicks in between park visits! 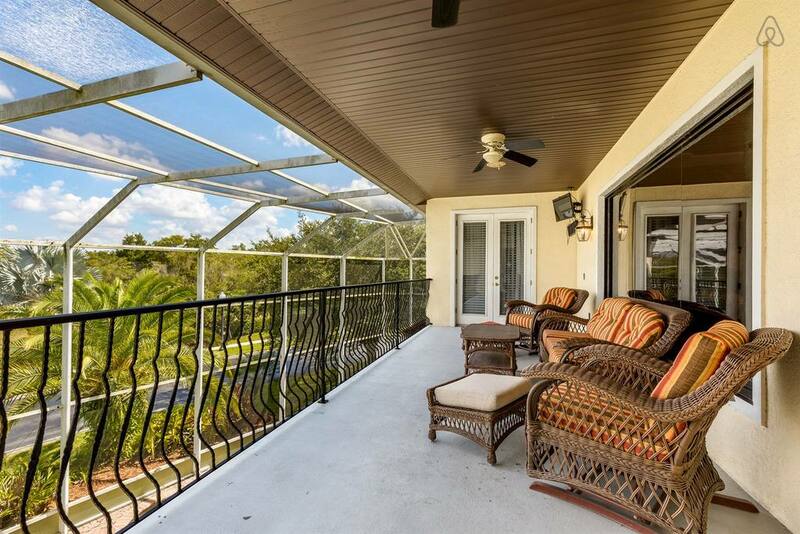 Outside is a 40-foot, saltwater swimming pool, hot tub, water feature, and spacious deck. 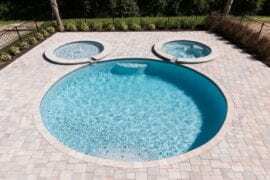 Even though you may never want to leave this inviting vacation home, the Disney theme parks are just a short drive away making this home an excellent value for around $560 a night. 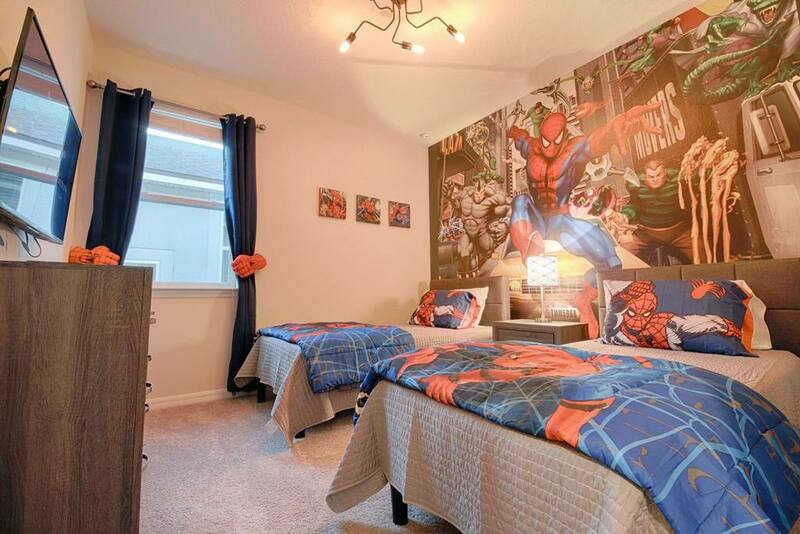 One of the best Airbnbs near Disney World for families with kids is this luxurious Orlando family home with themed rooms. 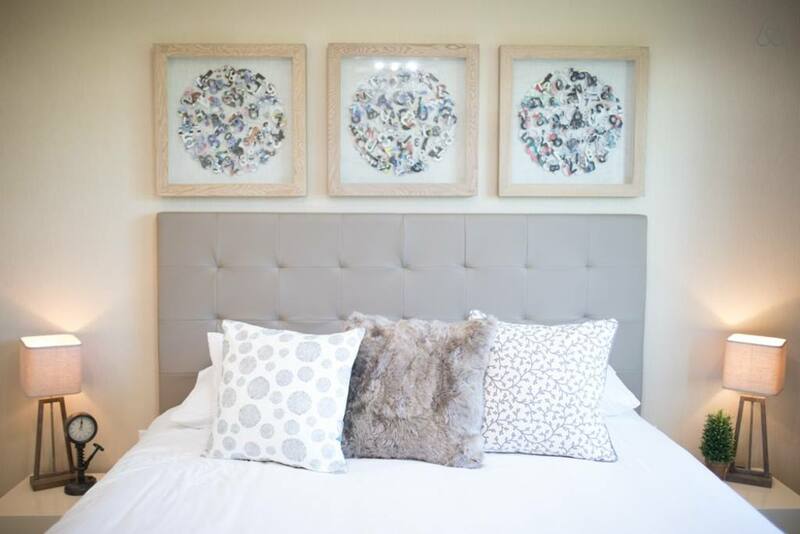 Kids will love the two themed bedrooms, decorated with Spiderman and Pirates of the Caribbean themes, while grownups will appreciate the more subtle decor throughout. Available from around $400 a night, this gorgeous home can accommodate up to 14 guests easily, with seven bedrooms and 6.5 bathrooms. 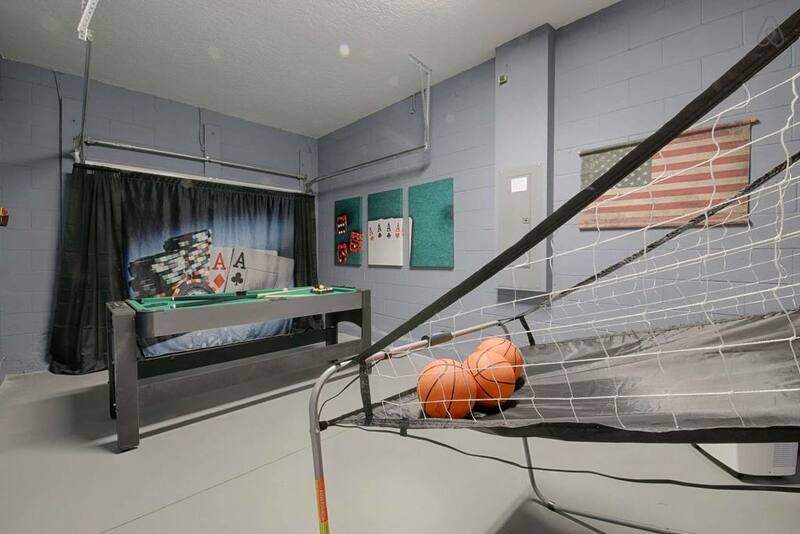 The garage has also been converted into a fun and funky game room, featuring a ping pong table, mini billiards set, and basketball game. Outside is a private swimming pool (which can be heated on request) and a hot tub, plus outdoor BBQ grill and sun loungers. The home is walking distance from the community clubhouse, very convenient for partaking in the complex’s fitness center, restaurant, and other great amenities. 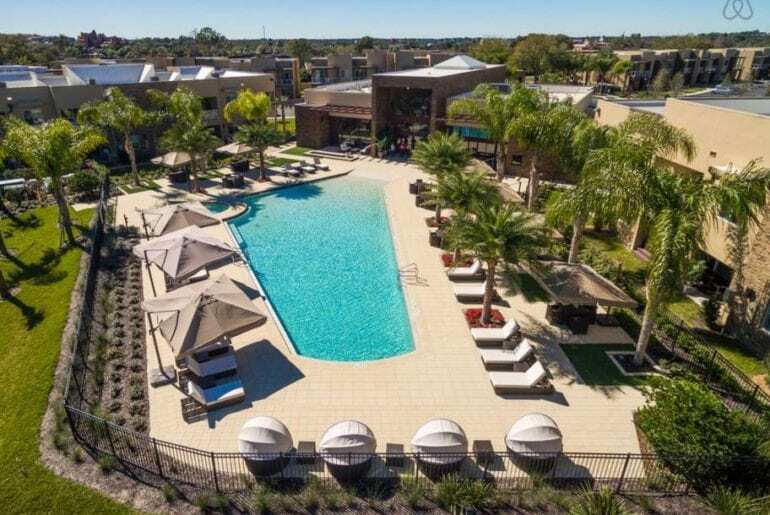 The best Airbnbs near Disney can be found in the desirable Reunion Resort community, an upscale area located just minutes from the theme parks. This gorgeous private villa in Reunion can accommodate up to 14 guests starting around $850 a night. 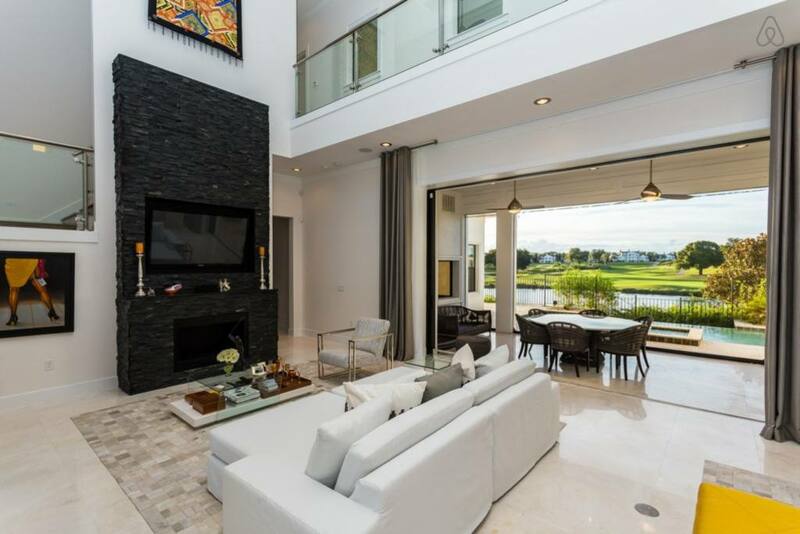 Backing onto a beautiful golf course, the property boasts incredible views and an open, airy floor plan. The two-storey living space contains a modern chefs kitchen, comfortable lounge, fireplace, and dining area. 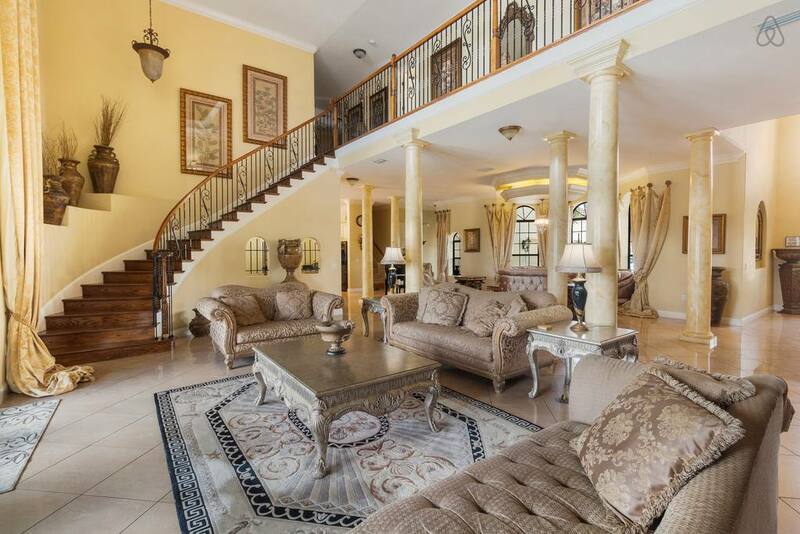 Four large bedrooms with seven total beds are located on both floors of this unique luxury villa rental near Disney World. There’s lots of space to relax together or entertain, including a spacious rear balcony overlooking the stunning golf course view as well as a fantastic back patio. 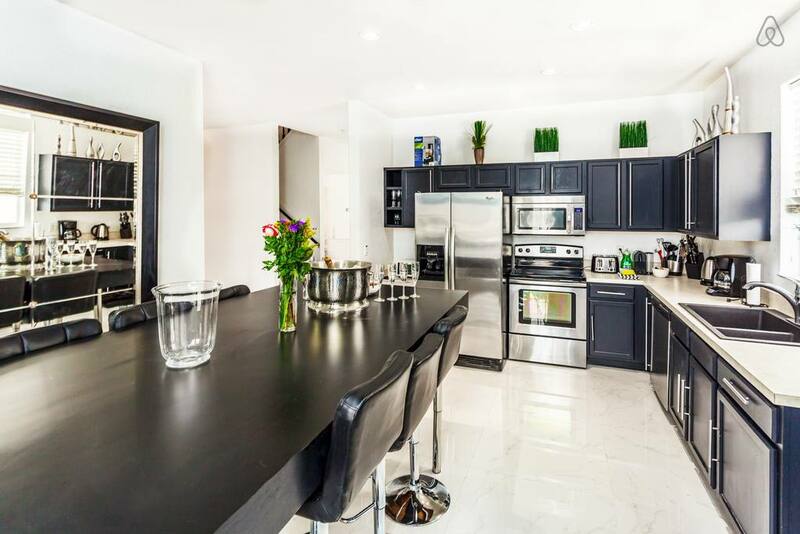 Enjoy the huge swimming pool and private spa, or cook up a delicious Brazilian BBQ in the fully-equipped summer kitchen. We’ve saved one of the best Airbnbs near Disney World for last! 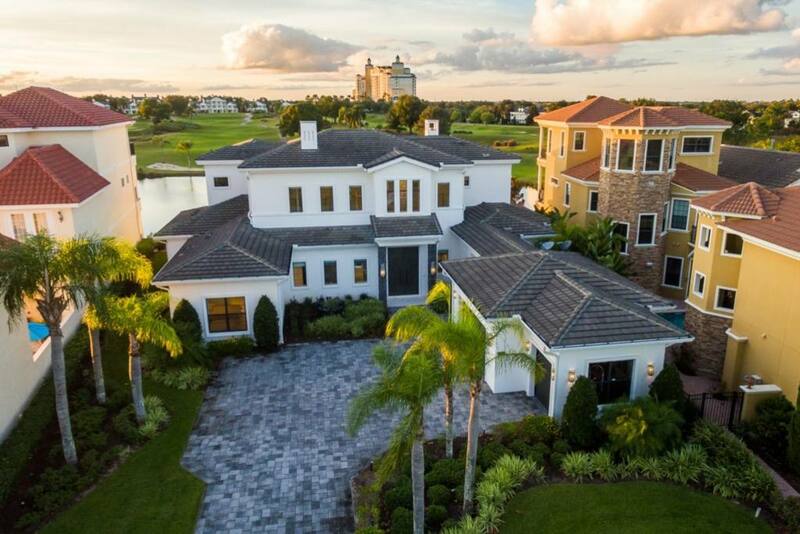 This sprawling private estate in Formosa Gardens is dripping with luxury less than 10 minutes from Disney. One of the most desirable addresses in Orlando, this elegant estate is ideal for a large family reunion, wedding, or special event. You and your guests will be blown away by this unique Disney vacation rental’s opulent design and ultra-luxe amenities, all available from around $1,100 a night. This custom-designed, lakefront mansion can easily accommodate 16+ guests with nine bedrooms and 10 bathrooms. “Opulent” doesn’t even begin to describe this place. 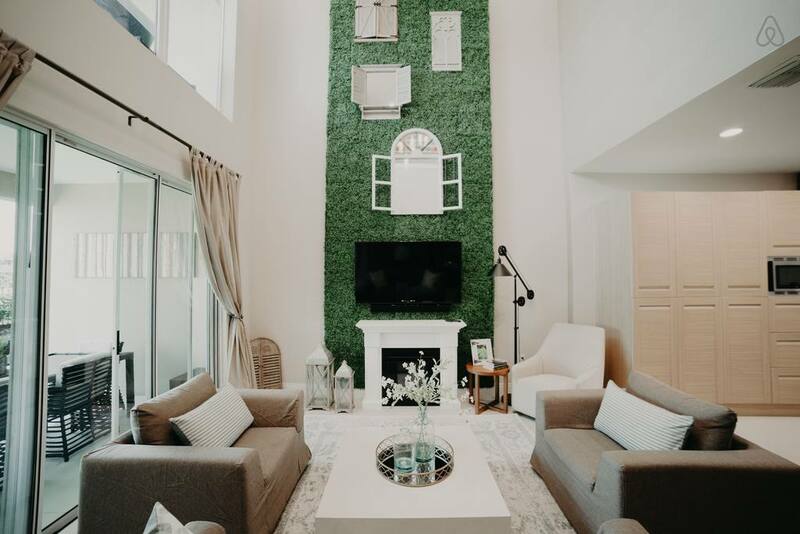 Get a taste for how the other side lives when you step inside and admire crystal chandeliers, gilded gold accents, polished marble floors, a grand staircase, and soaring 20-foot ceilings. No expense was spared outside either; discover a 55″ infinity edge swimming pool with cascading waterfall and integrated spa, all overlooking the lake. This home is truly one of the most incredible Airbnb homes near Disney!